Swan-Ganz catheterization is the passing of a thin tube (catheter) into the right side of the heart and the arteries leading to the lungs. It is done to monitor the heart’s function and blood flow and pressures in and around the heart. This test is most often done in people who are very ill. The test can be done while you are in bed in an intensive care unit (ICU) of a hospital. It can also be done in special procedure areas such as a cardiac catheterization laboratory. Before the test starts, you may be given medicine (sedative) to help you relax. You will lie on a padded table. Your doctor will make a small surgical cut into a vein near the groin or in your arm, or neck. A flexible tube (catheter or sheath) is placed through the cut into a vein. Sometimes, it will be placed in your leg or your arm. You will be awake during the procedure. A longer catheter is inserted. It is then carefully moved into the upper chamber of the right side of the heart. X-ray images may be used to help the health care provider see where the catheter should be placed. Blood may be removed from the catheter. This blood is tested to measure the amount of oxygen in the blood. During the procedure, your heart's rhythm will be constantly watched using an electrocardiogram (ECG). You should not eat or drink anything for 8 hours before the test starts. You may need to stay in the hospital the night before the test. Otherwise, you will check in to the hospital the morning of the test. You will wear a hospital gown. You must sign a consent form before the test. Your provider will explain the procedure and its risks. You may be given medicine to help you relax before the procedure. You will be awake and able to follow instructions during the test. You may feel some discomfort when the IV is placed into your arm. You may also feel some pressure at the site when the catheter is inserted. 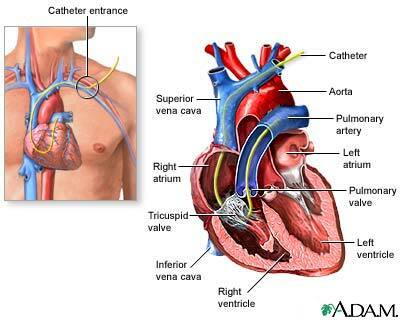 In people who are critically ill, the catheter may stay in place for several days. You may feel discomfort when the area of the vein is numbed with anesthetic. It may also be done to monitor for complications of a heart attack. It also shows how well certain heart medicines are working. Swan-Ganz catheterization can also be used to detect abnormal blood flow between two areas of the heart that are not normally connected. Kern M. Catheterization and angiography. In: Goldman L, Schafer AI, eds. Goldman-Cecil Medicine. 25th ed. Philadelphia, PA: Elsevier Saunders; 2016:chap 57. Sturgess DJ. Haemodynamic monitoring. In: Bersten AD, Soni N, eds. Oh's Intensive Care Manual. 7th ed. Philadelphia, PA: Elsevier; 2014:chap 16.